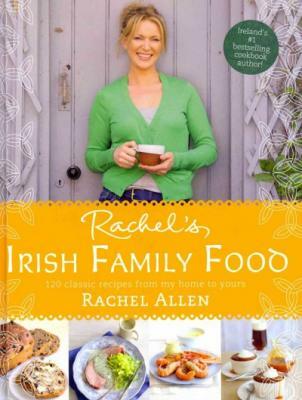 Rachel Allen, the face of real Irish cooking, shares the authentic Irish recipes that bring her family and friends racing to the table. With Rachel's Irish Family Food, you can bring a taste of Ireland to your table too. Bring loved ones together with this collection of delicious and simple recipes that highlight the best of authentic Irish cooking. Over 100 recipes that offer the best in both traditional and modern Irish cooking, from new twists on old classics to tried and tested recipes which have delighted many generations in Ireland and are sure to become firm family favorites in your home. Quick and simple dinners, big family feasts, sweet treats and celebration food, this is family cooking at its best, made to share with those most important in your life. Rachel's Irish Family Food will warm the heart and soul, fill the chairs around your kitchen table and fill your house with life and laughter. Alongside these gorgeous recipes you will find stories, history and insights into Irish life from across all the counties of Ireland to bring a smile to your face as you slow down and relish the joys of family, nature and great food. Ireland is indeed a magical place of rolling green fields, clear waters and the freshest ingredients for the table. Rachel Allen shows you the bounty of this beautiful place with honest, hearty, delicious family food. Rachel Allen was brought up in Dublin and at eighteen left to study at the prestigious Ballymaloe Cookery School in County Cork. Today, she not only teaches at the school but writes regular features for national publications, presents highly-acclaimed TV programs and in her spare time, writes bestselling cookbooks. She lives in near the sea in County Cork, Ireland with her husband and three beautiful children.